Likely and understandably, you’d feel cheated and angry. This is your time, energy, and creative effort, after all. And yet, unfortunately, having your Etsy product photography stolen is more common than you may realize. So what can you do about this? How can you prevent your product photography from being used by these third-parties? There are a couple different solutions you can try, but here at Watermark.ws, there is one option we believe outshines the rest. Should I watermark my product photos on Etsy? Yes. 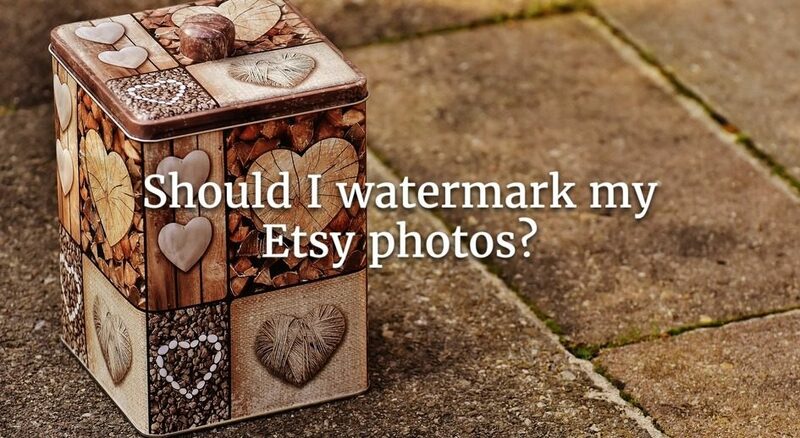 You should absolutely watermark your photos on Etsy. If you want to protect your photos from being used by others, a watermark is the only true solution. Many Etsy sellers also describe finding their images repinned through Pinterest, and while it is of course wonderful to have your work shared to attract more customers, if nobody knows where the work is coming from, they can’t find your shop. We agree that this advice is helpful, and we do recommend following these steps to further protect your Etsy shop, but there is one very obvious issue here: how does this stop third-parties from opening an unaffiliated shop and selling your products using your product photos? Because yes, this does happen. We can only imagine how upsetting it would be to see your products in somebody else’s shop, and we can assume that as a creator, you’d do everything in your power to keep your work in your possession. You deserve to profit off your own creations, after all. Third party, unaffiliated shop owners can use your product photography to create their own shops, selling your products. Images of your products can be repinned on Pinterest or other social sharing websites with no source for where the image came from. For artists, if you want to display your images in high resolution, it is easy for people to save your images, print them, and use them either commercially or for personal use. Either way, you’re losing out on a sale. Will a watermark hurt my Etsy sales? With so much competition in the Etsy marketplace, we understand your product photography can be your greatest selling advantage. The question for many Etsy sellers becomes: won’t a watermark distract from my product? Could a watermark deter a potential customer from purchasing my products? If you’re envisioning a series of watermarks smeared all across your photos, or you’re imagining the watermark covering an important aspect of the product, then yes, in these circumstances a watermark probably would hurt your sales. This doesn’t have to be the case, though. With Watermark.ws, our application is designed specifically to allow you to create unobtrusive and elegant watermarks. We give you total control over your watermarks so you’ll never have to worry about the watermark distracting from your product. However, it is important to be aware that unfortunately when you do watermark your photos, your products will no longer be eligible for features in Etsy Finds and will not show up on off-site advertising websites like Google Shopping. We tell you this not to deter you from watermarking your photos, but to ensure we’re giving you the most comprehensive guide to watermarking on Etsy. Remember, Etsy Finds and Google Shopping are only two forms of marketing you can explore for your Etsy shop. There are plenty of other advertising platforms you can use, like Facebook ads, Twitter ads, even Pinterest ads. And hey, if you’re not looking to spend a large sum of money on marketing, social media marketing is always a free way to build a loyal group of customers. Plus, with your photos all watermarked, you can now rest assured if your products are shared by others through social media, it will be clear where the image came from. So yes, while we do want to be upfront with you about the potential negatives of watermarking your Etsy photos, it all comes down to how important it is to you to protect your work. If you lived in a neighborhood that was known for break-ins, you wouldn’t just leave your front door wide open for anyone to walk in. You might not even feel comfortable with one lock. If you truly were concerned for your home, family, and possessions, you’d put multiple locks on your door and even install a security system. You’d do everything in your power to make your home as secure as possible. Think of your watermark as your security alarm. A thief may try and steal your work, but that watermark is your security system that alerts everyone of the theft. What’s the easiest way to watermark my photos? As mentioned, a watermark does not have to be distracting or obtrusive to your work. With Watermark.ws, it is our goal to allow you to place an unobtrusive watermark on your photo as seamlessly as possible. We give you the power to size your watermark, decide where to place the watermark on the image, and even control the transparency level of the watermark. These features ensure your work is protected, but also allows the watermark to blend seamlessly into the photo. And hey, If you don’t already have a logo, you can even use our application to design a custom watermark. The editor is straight-forward and easy to use, which is especially helpful for those who might struggle with more advanced applications. But you may be wondering what happens to that custom watermark after you create it. Will you have to continuously recreate your watermark every time you add new product photography? We’ve taken care of this for you as well. Easily save your watermark as a template and apply it next time you come back to Watermark.ws. You can even watermark multiple photos all at once. Batch processing means you don’t have to continuously apply watermarks individually to each photo. If you have a set of photos you need watermarked all at once, simply upload the photos, select your watermark, and our application will do all the work for you. We’ve thought of everything to try and make the watermark processing less of a headache for you. We understand the work you put into your Etsy business, and you likely don’t have the time to sit around and place watermarks on all your photos, especially if you have a large product assortment. We’ve shown you why watermarks are necessary. Now let us show you how to easily place unobtrusive watermarks on your Etsy product photos using Watermark.ws.